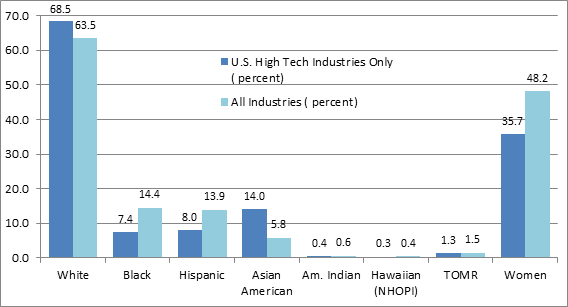 Of the people graduating from top engineering programs, 9 percent are black and Latino, but representation at tech firms typically falls around 5 percent, according to the EEOC’s recent analysis of the 2014 EEO-1 data the agency collected. That means the current talent pool is being underutilized, EEOC Chair Jenny Yang said today at a public meeting between EEOC commissioners and a panel of experts including Kapor Capital Partner Benjamin Jealous, McKinsey & Company Partner Kweilin Ellingrud, AARP Foundation Senior Attorney Laurie McCann and others. Orrick Partner Erin M. Connell at the EEOC teleconference in San Francisco. On screen is Benjamin Jealous, partner at Kapor Capital. The report also outlines a few “concerning trends,” like how the tech industry nationwide employed a larger share of white people, Asian Americans and men than the overall private industry, according to 2014 EEO-1 data. Among leading tech firms in Silicon Valley, 57 percent of executive employees were white, 36 percent were Asian American, 1.6 percent were Hispanic and less than 1 percent were black, according to the EEOC’s 2014 data analysis. Among the total employed at top Silicon Valley tech companies, 47 percent were white, 30 percent were women, 41 percent were Asian American, 3 percent were black and 6 percent were Hispanic. Diversity and inclusion in tech, as it turns out, is a top priority for the EEOC. That sentiment was made clear today in Yang’s opening remarks and in the EEOC’s latest report. Although the meeting took place in Washington, D.C., I was able to sit in at the teleconference at the EEOC’s San Francisco district office, where Connell participated via the livestream. Ultimately, today’s meeting was a big brain-picking session around issues relating to diversity and inclusion, with the intention of bringing the topic to the mainstream and getting commissioners focused on it. The next step for the EEOC is having conversations with tech companies, though, the solution Jealous put forward to create a national mandate is one that could be really effective. “At the end of the day, it comes down to companies being reluctant to change,” Jealous said during the Q&A portion. Be sure to check out the EEOC’s full report here.